Yang Now More Receptive to Microsoft Buy of Yahoo! "Hey, remember when you were offering $33 a share for my company? Those were good times!" 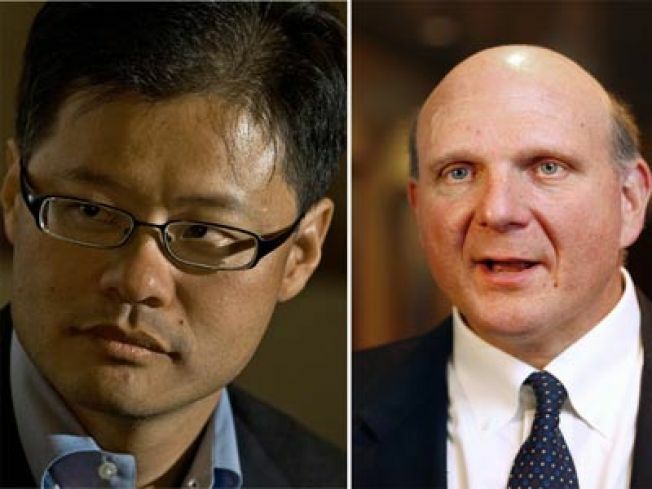 Jerry Yang is open to Steve Ballmer purchasing Yahoo! six months after he rebuffed Microsoft's offer. Now that a pivotal advertising partnership with Google is off the table, Yahoo!CEO Jerry Yang is ready return to the bargaining table with Microsoft -- if the world's largest software maker remains interested in buying his embattled Internet company. "To this day, I believe the best thing for Microsoft to do is to buy Yahoo!," Yang said Wednesday evening at the Web 2.0 summit in San Francisco. Although he said there aren't any current talks, Yang stressed he and the rest of Yahoo! Inc.'s board "remain open to everything" after a looming legal battle with the U.S. Justice Department prompted Google Inc. to abandon its rival. Google would have sold some of the ads alongside Yahoo! 's search results had the proposal panned out. Yahoo! had been counting on the Google alliance to boost its sagging profits and stock — an outcome that might have helped pacify investors still incensed about Yang's handling of a $47.5 billion takeover offer from Microsoft Corp. six months ago. Microsoft said it withdrew its $33 per share bid after Yang demanded $37 — a price that Yahoo! 's stock hasn't reached since early 2006. Echoing his previous public comments, Yang said he believes a compromise on the sales price could have been reached if Microsoft hadn't ended the talks so abruptly. "Did we want to do a deal with Microsoft? Yes," Yang said. "Had we been able to do that, we would have been very happy, but it wasn't meant to be." Microsoft has been giving mixed signals about its interest in Yahoo! Although the company repeatedly issued statements that Microsoft Chief Executive Steve Ballmer has moved on to other things, Ballmer suggested as recently as last month that buying Yahoo! in its entirety or just its search operations could still make sense. Industry analysts believe Microsoft will make another run at Yahoo! within the next few months. The reason: Yahoo! 's No. 2 search engine and huge audience still remain Microsoft's best chance to gain ground on Google and its industry-leading search engine in the Internet's lucrative advertising market. Yahoo! also looks more vulnerable than ever, having lost the Google partnership. The Sunnyvale-based company's shares closed Wednesday at $13.92 — nearly 60 percent below Microsoft's last offer. The stock gained more than 4 percent in Wednesday's depressed market, largely because some investors believe another Microsoft eventually will make another bid. Wednesday's rally was driven, in part, by rumors that Yahoo already was negotiating a sale to Microsoft for $17 to $19 per share — speculation that both companies denied. There was also talk that Yang would step down as CEO, but he said he still believes he is the right person to engineer Yahoo's attempted comeback. "If you are not in the game to win, you shouldn't be in the game," Yang said. "That is how I encourage the whole company to think about it." Yang said he was disappointed that Google didn't fight to protect their proposed advertising partnership in court, contending the Justice Department's conclusions were flawed. The Justice Department said it was prepared to attempt to block the alliance because it would have consolidated more than 90 percent of the U.S search advertising market, turning Google and Yahoo into "collaborators rather than competitors." "I really thought the government in this case does not understand our industry," Yang said. "They have a market definition that is too narrow." Yang predicted Yahoo! would still prosper without Google's help. "I feel there is a presumption that if we don't have the Google deal, we aren't going to do well in search. That is absolutely not true," he said.